The Review Books are designed to be used as a Two-week Review prior to the STAAR Test or in a RtI type class. The Review Books focus on Readiness Standards using engaging activities, formative assessments centered on Readiness Standards and Reporting Category Assessments. The activities are designed to allow students opportunities to process in-depth learning through reflection pages, journaling, and key items to remember. Facilitating questions, teacher’s notes, and Pacing Guides help teachers stay on track. 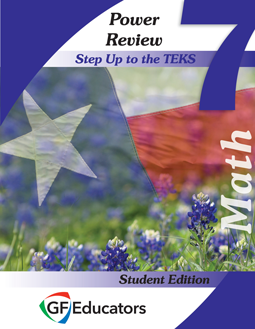 View a Sample of the 7th Math Power Review Student Edition by sending an email to info@stepupteks.com asking for the password. Accompanies the 7th Math Power Review Teacher Edition. Stumped? Send your credentials to yourself.